A few years ago, when the government were keen as mustard for us to join with Wellington and its near neighbours to form a super city, those local body cadres who rule our roosts joined together to fight the Mephistophelian suggestion. They spent a small fortune on consultant’s, instructing them to discredit the concept and to particularly pour cold water on the Greater Wellington Regional Council’s claim that it spent millions more in our neck-of-the-woods than it collected in rates. The proposal was subsequently set aside by a plebiscite of citizens, confused by the claims and counter-claims, and encouraged by the three Wairarapa councils promising to amalgamate. It was a clever sweetener, but I have seen little progress towards any form of merger; in fact my money says it will never happen. The problem is parochialism, and it doesn’t just occur here. Upper Hutt and Lower Hutt didn’t want to join Wellington or even join together, despite the similarity in their nomenclatures. Porirua was the only district who was prepared to coalesce, probably bullied by their progressive Mayor who recently narrowly missed out on his move sideways to become the Mayor of Wellington. 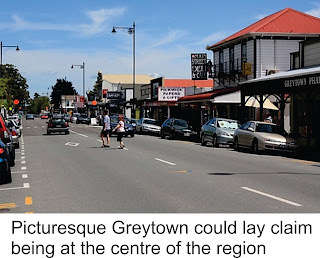 I suspect the dilemma is where to establish the “head office.” Greytown could lay claim by being the centre of the region and Carterton will counter that by asserting they have a new civic centre ready and waiting. Most of those living south of the Waingawa river will not want to see big brother taking the initiative, but honestly, where else? Despite its extreme northerly aspect Masterton is the commercial and service centre of the region. Many government agencies are situated in Masterton including WINZ, Child Youth and Family, and Ministry of Social Development and these have close relationships with the council. All the national banks have branches in Masterton, plus Powerco, Spark and Vodafone and a significant number of technology companies and rural-based services. The thriving Waingawa industrial complex is officially in Carterton, and yet is largely serviced from Masterton. The two Iwi, with weighty final settlements in the offing, are based in Masterton. Primary care health facilities are significant and the Wairarapa Hospital has staff numbers exceeding 400. Trust House with a similar employment level has its head office in Masterton and the Greater Wellington Regional Council operates out of Chapel Street with more than 100 staff, its largest presence outside of Wellington. The point I’m trying to make is that with a population of 24,400 democratically Masterton would overwhelm the smaller towns and I don’t think they would find this acceptable. An example: at the recent local body elections, despite some excellent nominations from Carterton and South Wairarapa, no one south of Masterton was elected on to the District Health Board. And my clear recollection is that in 1989 when the three South Wairarapa districts amalgamated, thereby losing two mayors in the process, the towns lost their sense of identity. Certainly without the gregarious Bill McKerrow Featherston became a shadow of its former self. I detect a lack of enthusiasm from all parties charged with advancing the flawed union and if this inactivity were to continue I for one wouldn’t lose any sleep.